Ouno Design » Remember when all we had was lots of little pillows? 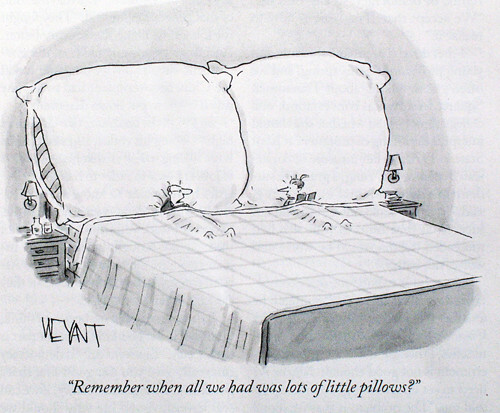 Remember when all we had was lots of little pillows? Too few pillows, maybe. From The New Yorker. But there’s such a thing as too many pillows… see below. This from HGTV’s “how not to decorate” tips demonstrates why too many pillows can be wrong. And why synthetic animal print can be wrong. And piping. This entry was posted on Tuesday, October 7th, 2008 at 7:02 pm	and is filed under design. You can follow any responses to this entry through the RSS 2.0 feed. You can leave a response, or trackback from your own site.